Put zucchini, onions through grinder. Mix well with 5 tbsp salt. Let stand overnight and then rinse with cold water. Drain well in colander. In a large kettle, mix the 8 remaining ingredients and cook till it starts to thicken (though it won’t thicken much at all). Then add ground ground vegetables and mix and cook slowly for 30-45 mins. Add to hot jars and seal. 3 small cloves of garlic, crushed and lightly chopped. In a large skillet, coat the bottom of the pan with about an 1/8 of an inch of canola oil and heat to medium high (just below smoking point). Slice the onion in half, remove the skin and then cut each half into large, thin slices. Add to oil and cook until dark golden brown (almost crispy). In the meantime, take the whole chicken legs and divide them into thighs and drum sticks by cutting them at the “elbow” joint. You save $$ by doing this yourself but if you are intimidated, you could always by 5 of each instead. Season liberally with Seasoned Salt on both sides. 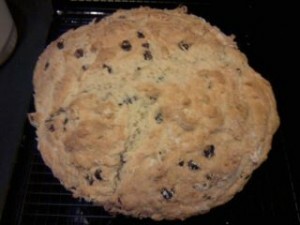 I have other recipes for Irish Soda Bread, but this is my new favorite.? We developed this one just before the last St. Patrick’s day party. It is much more moist and has a sweeter flavor than my old version. Combine all the dry ingredients including the raisins and butter and stir until evenly distributed. 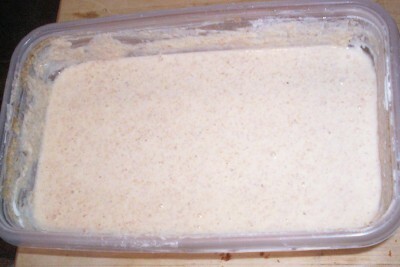 Blend all the wet ingredients and then add to the dry. Pour into a greased pie pan and let sit for 15 minutes. Use a knife and cut a large X into the dough and then bake for 60-70 minutes or until a toothpick inserted into the bread can be removed cleanly. Let it cool completely on a wire rack and then wrap.? It seems to taste better if you make it the night before, but that is optional. Over the last few months I have really taken an interest in wild yeast. Sure, those yeast packets you get from the store are fine, but the idea of catching something locally and enjoying a unique flavor just to your area is just too appealing to me. Everyone has heard of sourdough bread from San Fransisco and the reason why you cannot get that anywhere else is because of the natural yeasts and bacteria native only to that area. These impart unique flavors to the breads from that region. Yeah, it isn’t pretty, but it is alive! So how does one go about catching their own yeast and making a starter? I can only tell you what I did, but you will find there are a lot of techniques out there, but for me, this is practically fool proof. We are all moved into the new house. Sure, we still have some things to put away, but I (and the site) are back online. Whew, what an adventure. I put my foot down, which is something I do not do very often, and made a proclamation to my wife that the next time we move, we must have enough money to easily pay movers to do it! Anywho, things are settling down and I hope to be able to get back to sharing recipes again. I have a couple in the pipeline that I am still tinkering with (when I get time). One thing I am really looking forward to writing about is kitchen layout. Now that I have spent a couple weeks getting ours in order, it is fresh in my mind. So be ready, the recipes are coming in!